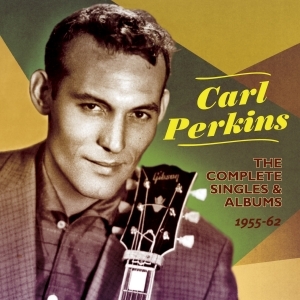 Carl Perkins was the most important of the rockabilly artists who came to prominence as one of the as part of the explosion of rock ‘n’ roll during the middle years of the 1950s. His landmark hit “Blue Suede Shoes” became one of the most covered and performed songs of the era, a staple of the repertoire of every rock ‘n’ roll band around the world. As one of the core of artists who recorded at Sam Phillips’ Sun Studios in Memphis alongside Elvis Presley, Johnny Cash and Jerry Lee Lewis, he was central to the development of the sound which changed the face of popular music. Paul McCartney once observed that “if there were no Carl Perkins, there would be no Beatles”. Perkins came to personify the rockabilly style, since he stayed true to it over the years, and he rightfully became known as “The King Of Rockabilly”. This collection comprises the A and B sides of all his singles and all the album tracks released on Sun and then Columbia from his debut in 1955 through to 1962 in a great value 53-track 2-CD set, and it’s a fine showcase for his distinctive style and unique talent.